Ezra Friedlander's thoughts on Pesach and Shavuos were the time period of the "Hungarian Yahrtzeiten." For those who are old enough to remember, the weeks between Pesach and Shavuos were the time period of the "Hungarian Yahrtzeiten." Actually, the "Hungarian Yahrtzeiten" are ongoing, but unfortunately many of those who observed the yahrtzeit are no longer with us. Perhaps some readers know to what I am referring, but many of the younger generation have not personally experienced the raw emotions that arose when Holocaust survivors wanted to express their pain and participate in the yahrtzeits of their mothers and fathers, brothers and sisters. I remember this time period well. As the son of the Liska Rebbe, shlita, I recall seeing how difficult it was to allot the various aliyos and appoint shlichei tzibbur in our shul, Kehila Ateres Tzvi M'Liska, so as to offer some measure of comfort to survivors who wanted to participate in the sacred tradition of honoring their parents and or siblings. My father always stresses that because they were murdered al kiddush Hashem, the kedoshim merit a tikkun even if no one says Kaddish or davens for them. But first one must understand what we are talking about. of the Final Solution. In 1942, 2.7 million Jews were murdered by the Nazis but only 200,000 were gassed at Auschwitz Almost one-half of all the Jews who were killed in Auschwitz were Hungarian Jews who were gassed in a ten-week period in 1944. Up until the spring of 1944, the camps at Treblinka, Belzec and Sobibor were the main Nazi killing centers, not Auschwitz. 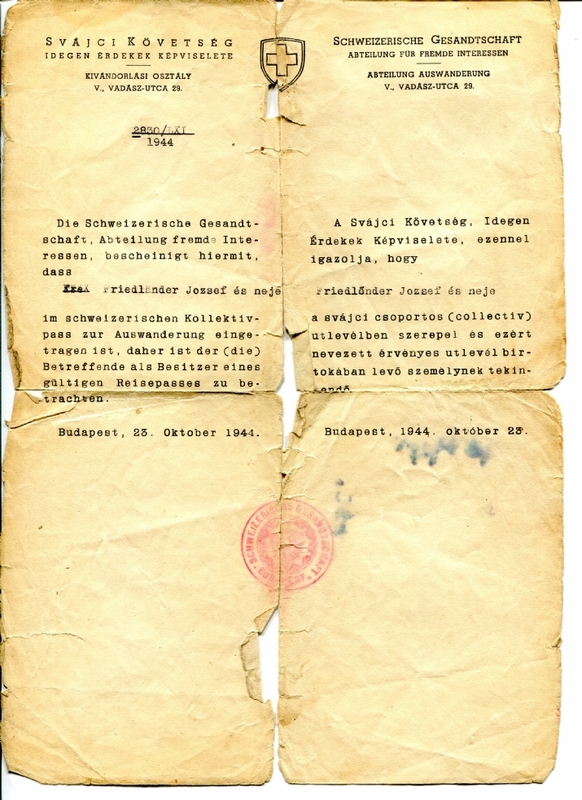 For the Jews who managed to escape to Budapest, there was some chance of survival. 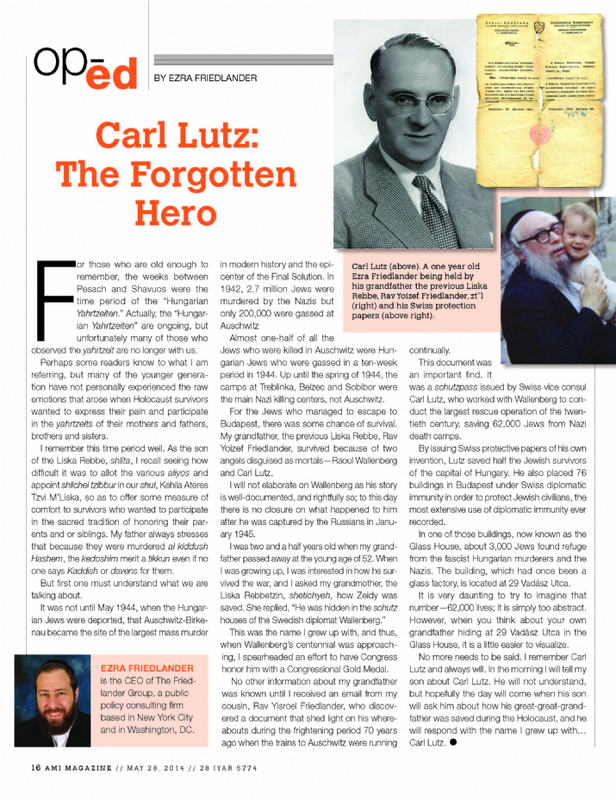 My grandfather, the previous Liska Rebbe, Rav Yoizef Friedlander, survived because of two angels disguised as mortals: Raoul Wallenberg and Carl Lutz. I will not elaborate on Wallenberg as his story is well-documented, and rightfully so; to this day there is no closure on what happened to him after he was captured by the Russians in January 1945. I was two and a half years old when my grandfather passed away at the young age of 52. When I was growing up, I was interested in how he survived the war, and I asked my grandmother, the Liska Rebbetzin, shetichyeh, how Zeidy was saved. She replied, "He was hidden in the schutz houses of the Swedish diplomat Wallenberg." This was the name I grew up with, and thus, when Wallenberg's centennial was approaching, I spearheaded an effort to have Congress honor him with a Congressional Gold Medal. No other information about my grandfather was known until I received an email from my cousin, Rav Yisroel Friedlander, who discovered a document that shed light on his whereabouts during the frightening period 70 years ago when the trains to Auschwitz were running continually. In one of those buildings, now known as the Glass House, about 3,000 Jews found refuge from the fascist Hungarian murderers and the Nazis. The building, which had once been a glass factory, is located at 29 Vadasz Utca. It is very daunting to try to imagine that number 62,000 lives; it is simply too abstract. However, when you think about your own grandfather hiding at 29 Vadasz Utca in the Glass House, it is a little easier to visualize.